When it comes to a reliable, compact SUV, nothing beats Honda. With the all-new and revamped 2017 Honda CR-V, the company has stepped up its game. While the previous version was quite forgettable, the 2017 CR-V is attractive and muscular, with a new front fascia, sculpted exterior, and redesigned rear windows. 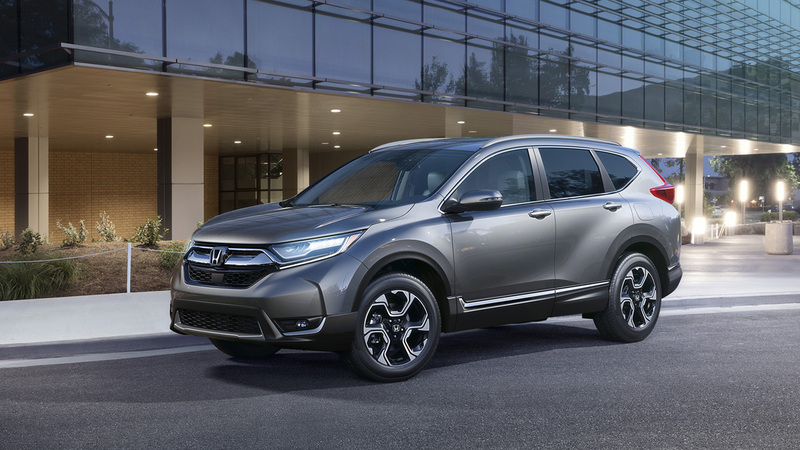 Along with sophisticated looks, there’s a turbocharged engine and a host of features that make the CR-V an SUV worth the money. The 2017 Honda CR-V comes in four trim levels: LX, EX, EX-L and, Touring. While the base LX level is powered by the 1.5-liter turbocharged four-cylinder engine, the other trims come with a 2.4-liter, four-cylinder engine, offering 184 horsepower. The CR-V comes with one of the best CVT and standard front-wheel drive. Buyers also have the option of choosing an all-wheel drive. The 2017 CR-V has evolved I’m every aspect of the previous model. While earlier, the base models came with 16-inch wheels, now buyers get the choice of either 17- or 18-inch aluminum wheels. The drive quality and acceleration are apt at the price point, with good speed and capable handling, both for everyday commutes and long distance rides. The CVT performs great, and the cruise control is good too, even though it cannot manage speed going downhill. The CR-V delivers quality comfort too, with the power driver’s providing eight-way adjustment, and four-way lumbar, ideal for drivers of all heights. There is ample room for both the front and back seat and passengers will not complain even on long rides. The tires are strong enough to absorb the bumps, giving a smooth and composed ride, while noise and vibration are at a minimum. There is some wind and tire noise, but it isn’t loud enough to drown out every other sound. The interiors are more stylish than the previous models, with little touches of practicality that make driving a joy. The opening height can be adjusted for the rear hatch for smaller garages, and all four windows can be vented on hot days by holding the unlock button. There’s plenty of room for cargo too, with the multi-configurable center console holding an enormous storage well, and the clever compartments and height adjustable cargo floor allowing the easy storage of both big and small items. The CR-V offers a towing capacity of 1,500-pounds, and there’s also room for child safety accommodation. Technology features include smartphone integration and advanced safety features, and even though the entertainment system and voice controls can be a let-down sometimes, you can make up for it by plugging in your smartphone. Let New York Autobrokers serving the Manhattan and Bronx area use their 20 years of experience to get you the best lease payments or price on any car make or model of your choice. Call us at 631-446-4455 for more information!